It was love at first ride! I popped up like a cork during deepwater starts: both forward and backwards . My single 180 whip-ticks in the flats were so easy I was able to make doubles in the flats (that’s been a struggle for a few years). Over the next few rides I learned that the HO Freeride jumps better than anything I’ve ever had. The best way I can describe the general feeling is “floaty” and “light”. 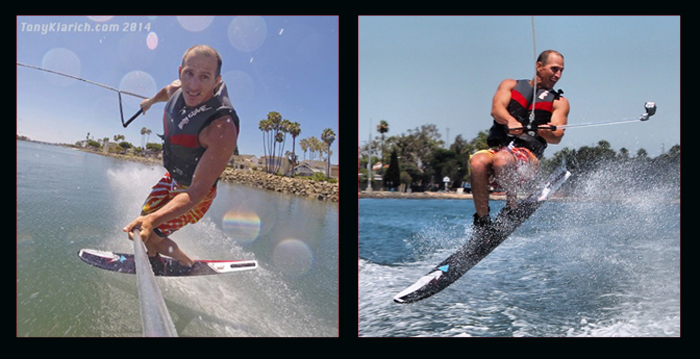 The new design of the bottom and unique wakeboard style rails in the front and back of the ski help generate lift. I have dropped my speed a couple of mph down to about 30. 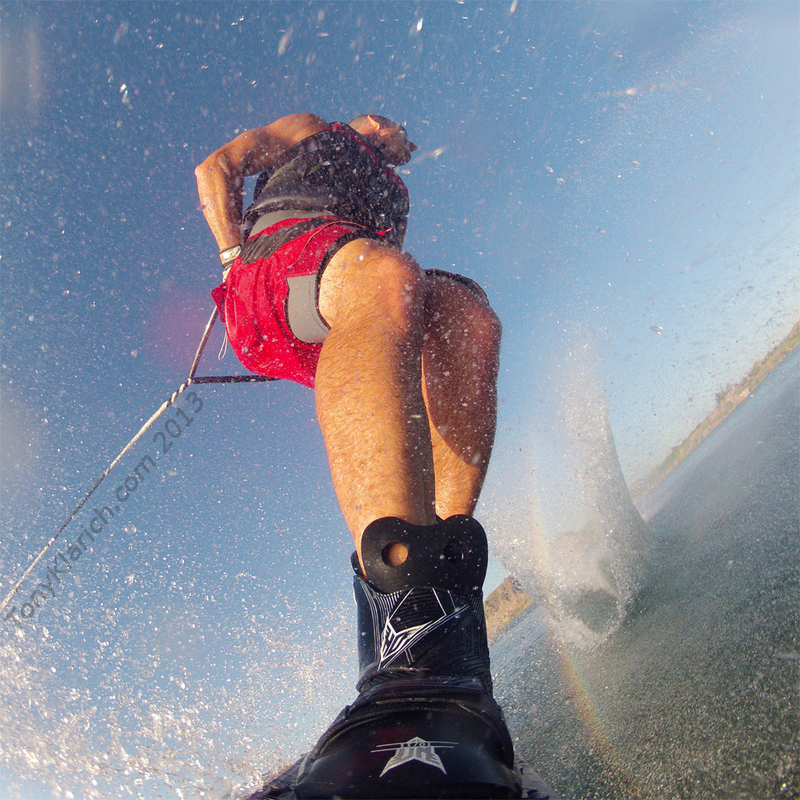 It’s nice to go a bit slower, but it’s still fast enough to experience the thrill of slalom skiing. This ski actually tracks backwards, which is so important for so many tricks. I’ve never had a ski do that, and just thinking about it is going to open up some all new moves. The wake 360s are back stronger than ever, and I’ve been making 540 Tick-Tock landings with ease. I’m just waiting for a nice day and a good videographer to try a few 720 Tick-Tock landings. I have only ever made 2 or 3 of these on a standard slalom ski, and know I can add it as a regular move for the first time ever! HO Skis was kind enough to set me up with a 67″ and 69″ model, but they are so new I’m not sure which one will be my “go-to” ski. 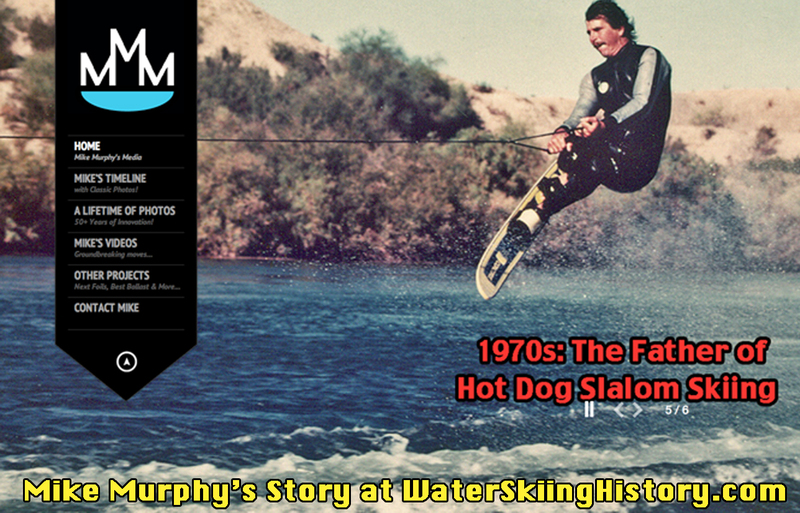 As has always been the case, the best hot dog ski also makes the best ski for most recreational riders. 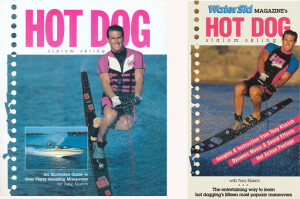 The HO Freeride follows in the West Coast Hot Dogger’s tradition of the Ski Master Concorde, HO Turbo, and HO Vertical Air. Front Binding: HO Animal. In my opinion there is nothing like a rubber boot. They are tougher to get into, but once that’s done with a little lube or shaving cream it is a positive connection between the ski and the foot. I move and the force is directly translated to the ski. Rear Binding: HO Classic RTP (Rear Toe Plate). Again this binding is 1 piece of solid rubber, and when I kick my back foot in, it is secure. Having the ability to take my foot in and out has been critical for doing trick on a slalom ski including beach starts, backwards deepwater starts, and the Tick Tock Toe. HO Vertical Air (circa 1995): I occasionally break this ski out for a fun ride at slower speeds (about 27 mph). This ski is super stable and predictable. Even though it was made specifically for doing tricks, it works great as an all around ski. My son used mine as his slalom ski from about age 10-15. My Vertical Air is also the ride of choice when flying the wake kite. This ski in particular (far left) was a gift from Herb O’Brien. He laid this ski up with custom Joker graphics as a gift because I was the Joker (the costumed kneeboarding character) for Herb and HO in the mid 1990s. 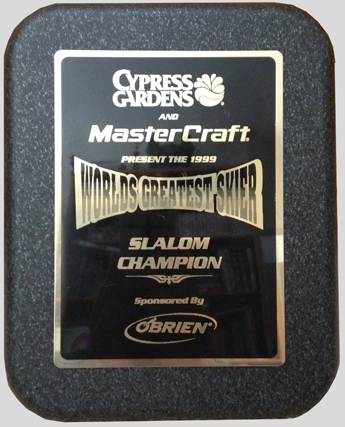 HO PSR (circa 1996): This is my “oldie but a goodie ski” for the slalom course. It has the short lived “Power Sticks”, but one way or another it has carried me through the buoys for at least a few sets each year. When I last trained for the course for the 1999 “World Greatest Skier” contest (Flight, Vol. 3.4) I was able to make 6 @ 35 off, 34 mph – good enough to win 1 of the 10 events. I would love an upgrade to the new technology, but no one is offering a free ski yet!